We have been having some problems with the internet connection of our servers. In Total we have got 4 root servers with all different windows versions. Which all have the problem of cutting out the internet connection. and it depends on the driver we use. Some of the drivers do it less often then others but they don't provide the full internet connection. We have tried using Linux But even then we have the problem of the internet connection stopping. At the moments the server connection stops working we get kicked from the remote desktop and Even kvm sometimes stops working. We have tried everything we could come up with but we don't know what the problem is. If we call or mail Netcup we just get a mail back telling us that it's basically not their fault and that would mean that we would have no other choice than to look for another server hosting. I hope somebody knows a solution to this problem and is able to help us. For any further information join our teamspeak and ask Roy or Pascal (If they are online). - What do you see in your monitoring software? - In which intervall are these disconnects? - What are the log file entries? - You say it depends on the driver, even on linux. There are no known problems with any driver. - What is your network setup, e.g. linux? - Every driver provides a full internet connection. :Some of the drivers only give up to 100mbit/s not the 1gbit we pay for. - What do you see in your monitoring software? :Nothing strange, CPU load doesn't change and internet usage also stays the same. - In which interval are these disconnects? :The interval is totally random sometimes its around 2 hours and sometimes even 5 minutes. - What are the log file entries? :Nothing strange or different from normal. - You say it depends on the driver, even on Linux. Okey there may not me any problems with the drivers but i still get some drivers disconnecting faster then the other. You are providing much to little technical information for helping you. I think you want to boot the rescue system and recreate the problem there. If the problem persists, you should reach out to the support. I am sorry but what kind of information would you like? They all have the problem and we have already called support and wrote them several email in which they all tell us that they are not able to help. Please don't write into a quoting. This is rude. oke i am sorry that i did that but could you maybe say which kind of information you would need so that i am able to provide it. Windows: I don't use that. Linux: Serverside: Usually you check your check access log. Are there any successfull requests while the outage? Do you see any interesting in the kernel ring buffer? Are there any events in the system log? Client side: How stable is your internet connection? Can you constantly ping your server and other google? While outage: Can you post a traceroute/tracert? Is ping successfull to google and your server? There are no events in the system log. The Ping Is always low but i am not able to look at that when there is an outage. Pinging is successful but i can't try it while it has an outage. 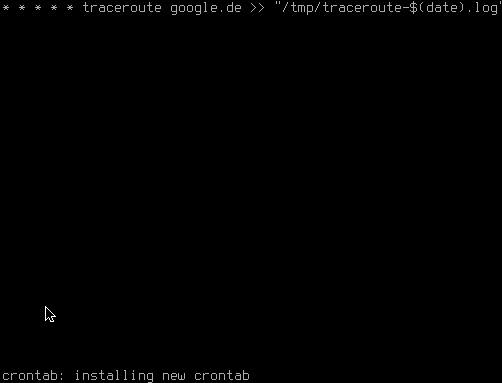 You could install linux and do traceroutes to google with a cronjob that runs every minute. When you experience the next disconnect, you can look at the output and maybe you will find something interesting. Of course you could probably also do that on Windows. Since i haven't got Linux installed so i would indeed have to do it on windows. The problem with that is that i have no idea how i would go about making it run every minute. i have tried googling it but i can't find a good solution. If somebody knows how to do this please help me with it. Use the rescue system in the SCP under Media -> Rescue System. Log in as root and type "crontab -e". * * * * * traceroute google.de >> "/tmp/traceroute-$(date).log"
When you experience disconnects, post the contents of the corresponding file . So i have been trying to get the traceroute working using the rescue system but i can't figure it out. First i start it up and press q to go to the shell. and after that i do "crontab -e" and once i am there i can't do anything. So i tried installing an program on windows and try it with that. That worked but after a few Outages i looked at the logs and there where no differences between the outages and the normal traceroutes. Maybe you are using vi(m) and don't know how to use it? Vim can be confusing. Hit i for insert mode (that means you can write). If you are finished typing the text, press Escape and and then ":wq" (colon followed by wq) and hit return. Try using "EDITOR=nano crontab -e" if you don't want to use vi(m). So i did what you said and now i got this. I have never worked with this before and really don't know what to do. Should i start windows now or what do should i do? this script will log traceroutes in to /tmp/ every minute. so you can download this file from /tmp/traceroute*.log and inspect. So i have been away for a few days and i got back home and looked at the server and thought to my self, how am i suppost to see that the server is having an outage. (since there isn't anything running on it.) I have now shutdown the Rescue System and started windows but the problem has been getting worse. At the moment i haven't been able to connect for almost 10 minutes now, and it's really annoying. I don't know how to work with the rescue system because i have never worked with something like that. And i was hoping that somebody could help me with it because i have no idea. Okay I've took some look into it. Most of the Clients are connected in the Netherlands, Britain or Oversea. I've added a rule in the windows firewall to let ICMP flow freely and checked the network driver. I've setup-ed some WinMTR on both parties. Now we just can wait.